Microsoft Windows Malicious Software Removal Tool is a freely distributed virus removal tool developed by Microsoft for the Microsoft Windows operating system. First released on January 13, 2005, it is an on-demand anti-virus tool ("on-demand" means it lacks real-time protection) that scans the computer for specific widespread malware and tries to eliminate the infection. It is automatically distributed to Microsoft Windows computers via the Windows Update service but can also be separately downloaded. The program is usually updated on the second Tuesday of every month (commonly called "Patch Tuesday") and distributed via Windows Update, at which point it runs once automatically in the background and reports if malicious software is found. Alternatively, users can manually download this tool from the Microsoft Download Center. It records its results in a log file located at %windir%\debug\mrt.log. To run it manually at other times, users can start "mrt.exe" using the Windows Command Prompt or Run command in the Start Menu. As released, the tool is configured to report anonymized data about infections to Microsoft if any are detected. The reporting behavior is disclosed in the tool's EULA, and can be disabled if desired. In a June 2006 Microsoft report, the company claimed that the tool had removed 16 million instances of malicious software from 5.7 million of 270 million total unique Windows computers since its release in January 2005. The report also stated that, on average, the tool removes malicious software from 1 in every 311 computers on which it runs. As of 19 May 2009, Microsoft claims that the software has removed password stealer threats from 859,842 machines. In August 2013, the Malicious Software Removal Tool deleted old, vulnerable versions of the Tor client, in order to end the spread of the Sefnit botnet (which mined for bitcoins without the host owner's approval and later engaged in click fraud). Approximately two million hosts had been cleaned by October; although this was slightly less than half of the estimated infections, the rest of the suspected machines presumably did not have their automatic Windows Updates enabled or manually run. Since support for Windows 2000 ended on July 13, 2010, Microsoft stopped distributing the tool to Windows 2000 users via Windows Update. The last version of the tool that could run on Windows 2000 was 4.20, released on May 14, 2013. Starting with version 5.1, released on June 11, 2013, support for Windows 2000 was dropped altogether. Although Windows XP support ended on April 8, 2014, Microsoft announced that updates for the Windows XP version of the Malicious Software Removal Tool would be provided until July 14, 2015. ^ a b "Windows Malicious Software Removal Tool: Progress Made, Trends Observed". Microsoft. Retrieved 10 March 2010. Microsoft delivered the first version of the MSRT on January 13, 2005 in 24 languages to users of Windows 2000, Windows XP, and Windows Server 2003 computers. ^ a b c "The Microsoft Windows Malicious Software Removal Tool helps remove specific, prevalent malicious software from computers that are running Windows 7, Windows Vista, Windows Server 2003, Windows Server 2008, Windows XP, or Windows 2000". Microsoft Support Center. Microsoft Corporation. 8 December 2009. Retrieved 22 December 2009. ^ a b "Download Details: Microsoft Windows Malicious Software Removal Tool (KB890830)". Microsoft Download Center. Microsoft Corporation. 8 December 2009. Retrieved 22 December 2009. ^ Savill, John (2005). 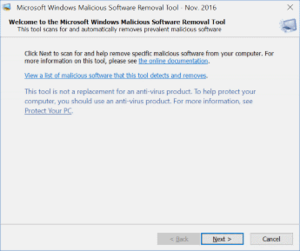 "Windows IT Pro - "What's the Microsoft Windows Malicious Software Removal Tool?"". Archived from the original on 2013-05-14. Retrieved 5 July 2006. ^ "Microsoft cleans password stealer tools from 859,842 PCs". Ars Technica. Condé Nast. 2009. Retrieved 21 May 2009. ^ McHugh, Molly (2014-01-17). "Microsoft's secret battle against the Tor botnet". The Daily Dot. Retrieved 2014-02-10. ^ "Microsoft uncovers Sefnit Trojan return after Groupon click-fraud scam - IT News from". V3.co.uk. Retrieved 2014-02-10. ^ "Tackling the Sefnit botnet Tor hazard - Microsoft Malware Protection Center - Site Home - TechNet Blogs". Blogs.technet.com. 2014-01-09. Retrieved 2014-02-10. ^ "Microsoft Takes Aim at Tor-Distributed Botnet - Computing Now | Newsfeed - IEEECS". Computer.org. Retrieved 2014-02-10. ^ Gregg Keizer. "Microsoft retains weapon to silently scrub XP". Computerworld. Retrieved 2014-02-10. "The Microsoft Windows Malicious Software Removal Tool helps remove specific, prevalent malicious software from computers that are running Windows 7, Windows Vista, Windows Server 2003, Windows Server 2008, or Windows XP (Revision: 89.0)". Microsoft Support. Microsoft Corporation. 12 July 2011. Retrieved 13 July 2011. Horowitz, Michael (6 February 2009). "What you don't know about the Windows Malicious Software Removal Tool". Computerworld Blogs. Computerworld Inc. Archived from the original on 18 July 2011. Retrieved 13 July 2011. Numbers in brackets are the years of the initial release of the product. This page was last edited on 9 April 2019, at 22:48 (UTC).